I knew that one day this time would come, and it’s finally happening. We’re hosting Thanksgiving! Since we’re splitting the holiday with both of our families, that means two Thanksgivings–which, more importantly, means TWO opportunities to set a fabulous Thanksgiving table. I mean, I’ve shared a fall tablescape here before, but let’s be honest, no one came over to eat…’twas purely for show. For years it’s typically just been me and my parents, and we’re a casual crew, so the need to go all out with decor and tablescapes was never really there. But this year…this year is my time to SHINE…for real people! For Thanksgiving lunch with my parents, it will just be the four of us, and like I said, we’re a casual crowd, so I’ve decided I’ll go the more traditional, natural route with my table setting. I borrowed the wooden chargers and turkey bowls from my mother, and then used pieces I already owned to complete the rest. When it comes to setting a table, I always refer to my go-to source for all things entertaining: Emily Post. Emily Post’s Etiquette is always within arms reach whether I’m planning a formal state dinner for a work event or simply entertaining at home. Seriously, I have two copies! She has all of the hostess-with-the-mostess answers. 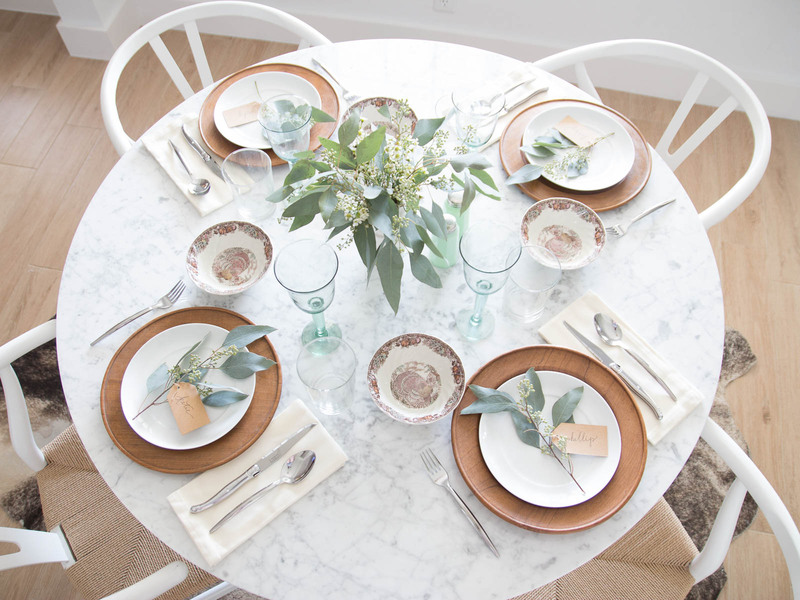 This basic table setting is perfect for casual meals at home. 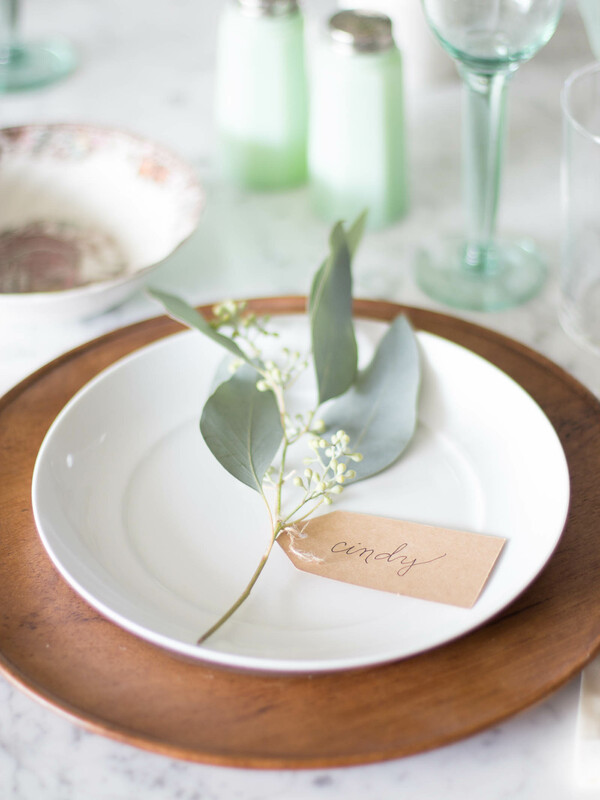 For the centerpiece and place cards, I used some simple eucalyptus sprigs that you can easily snag at Trader Joe’s / your grocery store or local florist. When making arrangements for a table, it’s important to keep them low so that your guests are able to see each other from across the table. To mark each person’s place, I found some craft paper gift tags in my gift wrap drawer and wrote everyone’s name. If you don’t trust your handwriting, you could also rubber stamp each person’s initial(s) on the tag for a rustic, farmhouse look. Speaking of shopping sales, pretty much every store has their Christmas stuff out already, so check to see if they’re offering any pre-season discounts. Garlands of greenery, plain pine trees and anything green can easily work into your Thanksgiving set up. Also don’t forget to check out the holiday gift wrap! I hoard gift tags and baubles before and after Christmas to use them throughout the year for times just like this. Plain white, gold, craft paper, etc…tags always make for the perfect place card in a pinch (as seen here), so don’t overlook them. AND, if you wait until after Christmas to re-stock your gift wrap arsenal, stores will basically pay YOU to get rid of their holiday inventory. Win! 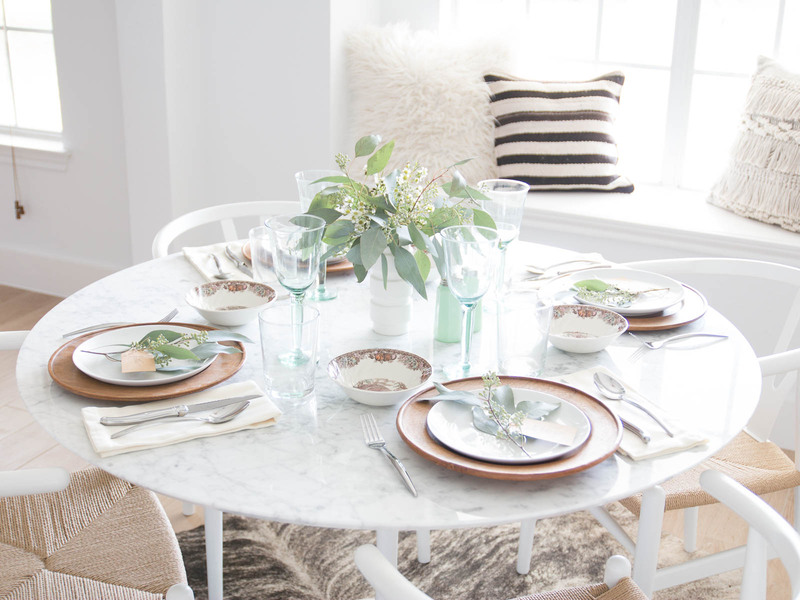 One of my favorite things to do when setting a table is SHOP MY HOUSE! Take inventory of things you already own–and think outside of the kitchen! You likely have a good number of things around your house that you can use to create a gorgeous table. You can always mix and match candlesticks, cloth napkins, vases, for a collected look. It works, I promise! Unlike setting tables, kids AREN’T really where I shine. I’m an only child, so I’ve never had any nieces or nephews to entertain, however Phillip does. To give them something to do while the adults cook or visit, I got some to-go containers (you know the foil kind with the paper lids that crimp around the edges) and plan to set up a ‘crafting’ station at the “Kids Table” with some colored pencils, markers, and maybe even some glitter glue if I’m brave. That way, they can create little festive masterpieces for each family member to take their leftovers home in. You can find the to-go containers at your local restaurant supply store, or, most restaurants will even let you buy some from them for next to nothing. Speaking of his niece and nephew, I’m planning something a little different for dinner with Phillip’s family (since there are more of them! ), so stay tuned for my other tablescape that’s going to pack a little more punch and a lot more color. Lastly, if you’re in the Austin area, be sure to tune in to KXAN’s Studio 512 Thursday (11/9) at 11:00am for more ideas on easy Thanksgiving entertaining! I love this, everything is so versatile for any holiday / event.. I love to bake but admittedly not the greatest cook and always seem to be scrambling at the last minute as a host. These are great ideas! Love this! Where is the rug from? Needed this! 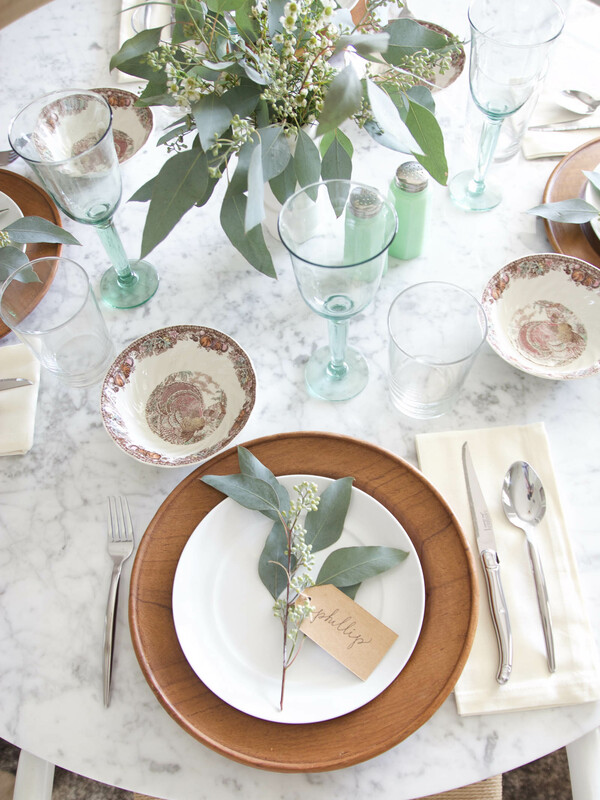 (Just yesterday was googling ‘thanksgiving tablescapes’ bc we’re hosting our small group friends-giving) Love the eucalyptus and always use in the house… will incorporate into our turkey day table! Yay! I’m so glad this was useful! Good luck on hosting — I’m sure it will be FAB! Thank you! And I’m not sure where the rug is from, I stole it from my parent’s house 🙂 But you can find similar ones on RugsUSA.com, Wayfair, Joss & Main, etc.. for decent prices! Thank you! And yes, I tried to make these ideas applicable for almost any occasion. And good on you for baking! I can’t cook (or bake!) to save my life, so I’ve settled on the fact that my strength lies in setting tables. I leave the food up to the professionals! Happy Thanksgiving!